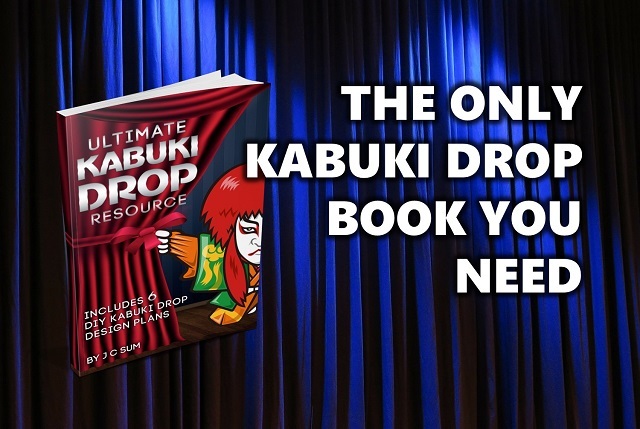 If you are a theatre or stage practitioner looking to add a strong piece of stagecraft to your shows or performances, this Kabuki Drop book is a must-have. The “Ultimate Kabuki Drop Resource” is the definitive reference on the Kabuki Drop. It is the only resource of its kind in the world on Kabuki Drops. The book has been categorized in WorldCat, the world’s largest library catalogue which is used extensively by most libraries in the world. The book will also be available to book wholesalers worldwide who will in turn supply it to libraries. Also detailed is a collection of six designs for simple manual curtain drop methods & designs that can be adapted to any theatrical performance or special event. The systems explained include the “World’s Easiest” Drop, “The Peel” Drop, “The Pull” Drop, “Pin & Loop” Drop, “Pull Back” Drop and “Roll & Drop” Drop. You purchase the book at here.